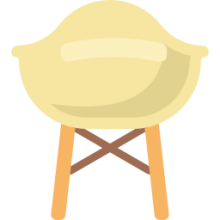 Portable cane chairs, or as they are known, portable stools and cane seats, or portable walking chair cane stools, are two-for-the-price-of-one medical devices (Source). They are designed to provide a comfortable and sturdy seat when opened, and a secure walking aid when closed (Source). The 1.3 lb., Drive Medical Deluxe folding cane seat is our top pick- it features a 9" diameter seat, a 250 lb. weight capacity, strong aluminum tripod tube design, and vinyl tipped legs for extra stability. Most users are pretty satisfied with this Drive folding cane seat, saying that it is sturdily constructed, supports heavier users well, and is great for travel. But the cane experience wasn't the same as a traditional cane, which isn't that surprising considering that this is a 2 for 1 option. Most users applauded these cane seats for their portability, lightweight design. This allows them increased range of travel for a variety of circumstances from enduring long amusement park lines to enjoying international travel (Source). Let's take a look at five of the best-selling folding cane seats on the market today and see how they compare. The Drive Deluxe Folding Cane Seat is stylish, modern and well-designed. When closed it can serve you as a sturdy support cane and when opened – it can function as a comfortable seat, depending on your needs. What most users love is how easy it is to use and carry the Deluxe Seat around, but some note that the seat is too small for bulkier people. 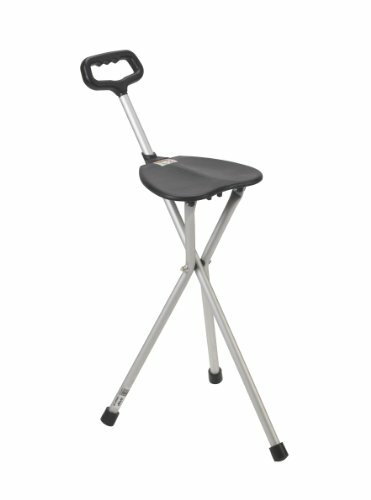 Made from aluminum and designed in the form of a tri-pod with vinyl contoured tipped legs, the seat weights remarkably little – 1.3 lbs, but can withstand an astonishing 250 lbs. If a long walk or travel is ahead of you, this product is something you should keep in mind. The general user consensus about the Folding Cane Seat is that it’s light, stable, convenient and comfortable. One user mentions that the Deluxe Cane Seat helps a lot with his lower back pains and that it’s ideal for people who have to spend a lot of time in one place. Other users share that they use the Portable Seat while on a cruise, waiting in a queue, in the garden and various other places without any problems. Some people did complain about the plastic handle and mentioned that the folding seat broke when they used it, but the majority of users were pleased with their choice. The Drive Folding Lightweight Adjustable Height Cane Seat is a well-thought-out, innovative and easy-to-use product that can serve you both as a supportive cane or as a place to sit when you need. Its users love the fact that its height can be adjusted – from 19″-22″- to suit their own needs and that it’s light enough to carry around without problems. However, some note that the seat is too hard for their liking. 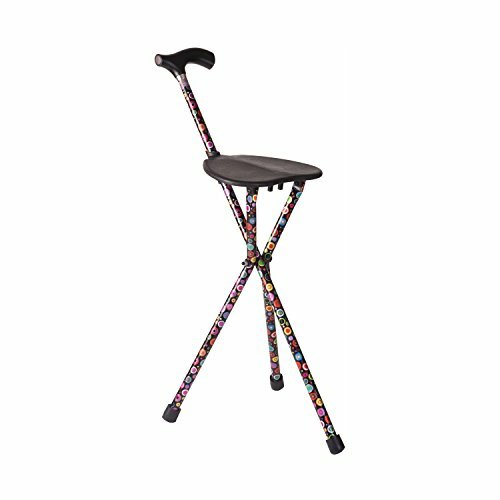 Made from aluminum and designed as a tri-pod with vinyl contoured tipped legs, the adjustable height seat weighs only 1.3 lbs but can withstand up to 250 lbs. If you are looking for an adjustable cane seat, which is portable and easy to use, this is a product you should consider. The general consensus regarding this adjustable height seat is that it’s easy to fold and unfold, and perfect for people who can’t stay on their feet for too long. Buyers use this walking stick with a seat everywhere and anytime- on the beach, waiting in a line, watching fireworks or parades or simple when they get tired of walking. One user shares that he doesn’t leave home without this lightweight cane-seat, while another comments that it’s far more comfortable than it looks like and that she loves it. Some users who had purchased the folding cane complained that it’s wasn’t as stable as they expected and it couldn’t bear their weight, but most of the purchasers were happy with the end result. The Mac Sports Folding Cane Chair is a unique, modern and stylish product that would make even the most tiresome walks pleasant with its ability to function as a walking stick and a stool. What users love about the Stick Stool is how easy is to carry it around, especially with its very own carry strap, but note that its height, unfortunately, can’t be adjusted to their needs. Made from polyester fabric and aluminum, the cane chair is very comfortable and weights only 2 lbs, but can endure up to 225 lbs. This folding stool could be perfect for the people who frequently need an available place to sit when out and about. One user comments that this Mac Sports Walking Stick feels more like a cane than other similar products due to the fact that only one leg touches the ground and that’s why he likes it best. 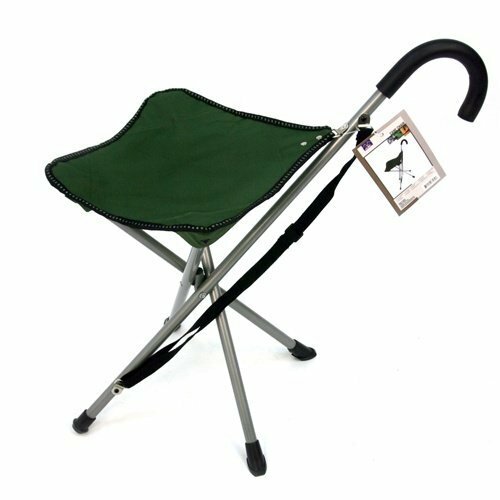 Another buyer shares that the Folding Chair is very stable with its four legs and that the carry strap is extremely convenient for long journeys. However, some customers advise that this Walking Stool should not be used on polished surfaces since it could slip, but mention that a simple rubber cap would solve the problem. 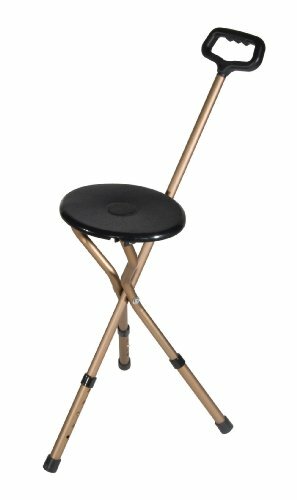 The general consensus is that the folding Stick Stool is light, steady and easy to use. This Portable Walking Chair is a fashionable, stylish product which can function as a walking stick or a chair depending on the circumstances. Users love that it’s sturdy, reliable, easy to use, but they note that it’s slightly unstable on uneven ground. Made from canvas and steel and designed as a tri-pod, this walking chair is slightly heavier than similar products, but offers a durable and comfortable seat and can withstand up to 250 lbs due to its steel legs. This chair stool is a good option if you are looking for a match between quality and price. The purchasers share that this walking cane stool is wonderful and perfect for anyone who cannot stay on his feet for any length of time. One user comments that he uses it daily because it’s so handy and compact, but still strong enough to support a heavier person. One other customer expresses his satisfaction with the Portable Cane and how it is a great help for people with back pains. However, some people complain that the plastic tips on the legs make it unstable and easy to slip, while others express their opinion that it’s too heavy to be used as a cane and it’s too tall for a short person. The folding, Switch Stick 2 –in -1 Walking Cane Seat is a unique, attractive and modern item, which offers you a great cane and a comfortable seat all in one place. What users love most about it is the fashionable design– the cute patterns and vibrant colors, but some note that the seat is very small and low. It is made from lightweight aluminum, so it’s easy to carry the Bubble Walking Cane around and it’s stable enough to withstand 220 lbs. If you are looking for a cane, but don’t want to look old, this Switch Stick cane seat is something you should consider. The general consensus of the customers is that the walking cane is strong, sturdy, easy to use, folds very easily for storage and takes a little room. Moreover, buyers share that they prefer this kind of cane seat because it looks less medical and old-fashioned and its beautiful colors add fun to any outfit. One young college reviewer also expresses his satisfaction with the Switch Stick Cane Seat, stating that he feels more comfortable using this uniquely patterned cane than any other. However, some customers have complained that the seat is very hard and small, so it puts pressure on the back, while others comment on the fact that this folding walking stick is not suitable for taller people. Many users commend these portable folding came seats for enhancing the quality of their life, or the lives of their elderly relatives-saying that it allows them to travel greater distances, and enjoy their lives more robustly. Some users opt for rollators- these are 4-wheeled mobility options or seat cushions to provide comfort when they travel. One user writes of attending a trade fair with her husband and saying that she would not have been able to endure the lengthy trip without the support of her Drive Medical tripod cane seat that let her sit and rest while her husband dealt with different information booths scattered across the location. Indeed, combining a traditional walking cane with a portable seat there is an innovative solution helping individuals with mobility and disability issues to ambulate more comfortably. Individuals with bad knees and troublesome backs, as well as sciatic issues, that prevent them from standing for long periods of time enjoy the functionality of these lightweight and portable folding cane chairs because they can take a seat whenever they require rest, and fold their unit into a sturdy cane whenever they need to move again. 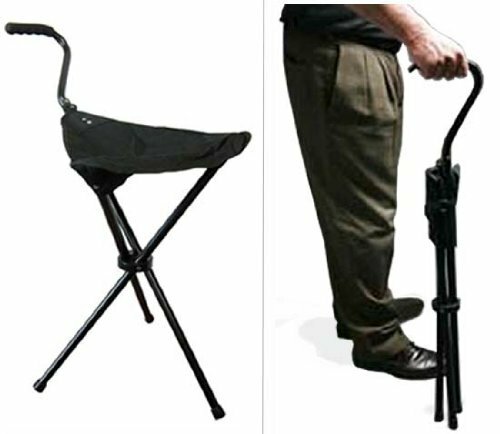 In general most users are pretty pleased with the walking cane seats that they purchased, saying that they are ideal for outdoor events, traveling to remote locations like shopping malls, waiting in lengthy lines, and great when you need a portable lightweight ambulatory walking aid solution. Different folding cane seats have different weight capacities, as well as seat surface materials- with the Stadium Chair Company and Mac Sports folding cane chairs featuring canvas seats and the drive medical walking cane seats having harder, plastic surfaces. Before you purchase one of these canes with seats for travel purposes, make sure that they are adjustable for your height, will meet your specific weight requirements, and choose between a canvas seat that may be a bit more forgiving, or a harder surface material that provides more solid and secure sitting support.